Bali, an island in Indonesia, is besides its beautiful nature and lovely people, wellknown for it’s handcrafted sterling silver jewelry. Sterling silver from Bali is completely compliant with the sterling silver standard of 925. The unique techniques and skills of the Balinese artist are passed on from generation to generation. The traditional Bali silverwork is made by hand with patience and skill, each piece a tiny treasure made by a silversmith, using only the best quality materials. These elements together with the so well known Bali style bold bracelets are so characteristic and unique for Bali jewelry. The designs of the Bali jewelry are often based on their traditions. Silver work with granules is characterized by tiny dots and gives the Bali silverwork its unique detailed granulation style. Traditional each of these tiny dots or details are soldered onto the original mold, carefully applied piece by piece. 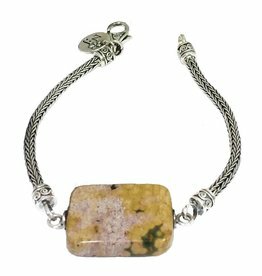 Sterling silver bracelet with ocean jasper, length 19,5 cm. Wonderful sterling silver necklace with canal house with bell gable.